Earlier this year we announced the 2018 Inspiring Excellence in Imaging Mentor Award Winners. As promised, we would like to introduce you to our winners. This week we will feature Ahmed Said Saad, MD from Egypt. Ahmed finished his cardiovascular training in Shebin Elkoum Teaching Hospital, Egypt after completing his Masters and Doctorate Degrees in cardiovascular medicine from Menoufyia University. His interest in echocardiography motivated him to earn his EACVI certification in Echocardiography. Currently, Dr. Said Saad is an interventional cardiologist and Head of the Echocardiography Lab at Shebin Eldoum Teaching Hospital, Egypt. He is involved with traning junior Fellows and residents in echo and coronary intervention. 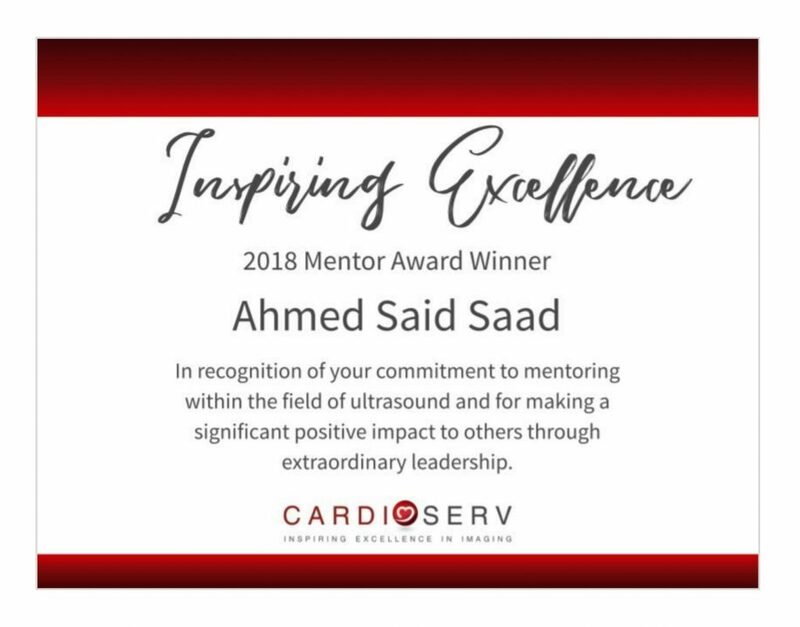 In addition, Dr. Said Saad is a member of the Egyptian Society of Cardiology and participates in a working group that focuses on cardiovascular education and CMEs. Many of Dr. Said Saad’s nominations came from members of his Facebook Group. If you haven’t checked it out yet you should take a look! There are dozens of full cardiology case studies with echocardiography images, cath lab images and patient history along with comments from physician peers. 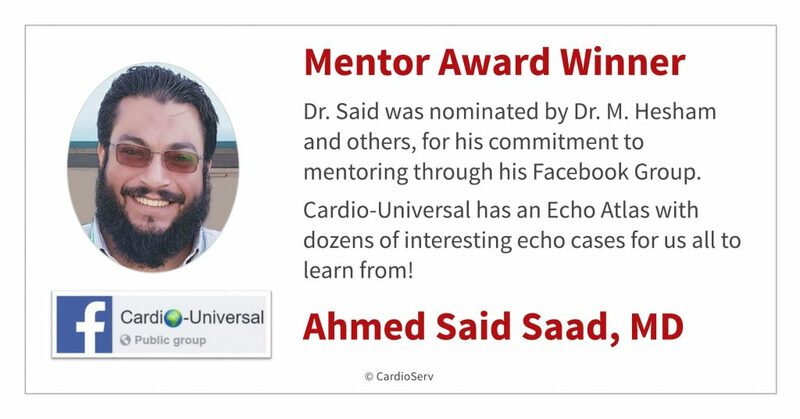 When we asked Dr. Said Saad about his Facebook Group he explained how he originally started the group to teach and advance echo knowledge within his group of peers from his local hospital. As the extensive library of echo cases increased he recognized the value of this material to those outside the hospital and expanded his reach world wide! The Facebook group then became Cardio-Universal and is accessible to all! We never know how our passion for mentoring and teaching others will grow. What started as a small Facebook Group to share knowledge with his peers is now an international educational resource! Dr. Said Saad is now the founder and moderator of an international Facebook Group, educating cardiologists and sonographers with valuable information and fantastic case studies! We are grateful for his time and effort and we encourage all our readers to check out and join his group. To learn more about his Facebook Group and how to use the Echo Atlas, read this weeks blog article that features a case from Cardio-Universal!